Having a credit card in your wallet is useful in many different ways, but it is not just the spending power it gives you that makes it attractive, it’s the benefits and rewards that often come with it that can really seal the deal. If you are interested in making some extra cash with your credit card, here are some ideas. It can be all too easy to think a small amount of cash back on your credit card purchases won’t make much of a difference to your bank balance, but over time, the cash that gets returned to you via incentives can add up to a significant amount of money. For example, the Chase Ink Cash card allows you to use credit and make purchases in such a way to help you manage your expenses as a small business owner, while also enjoying the added benefit of earning some cash back on your purchases. Getting up to five percent cash back on your purchases of up to $25,000, and a cash bonus in the first three months of getting your card can quickly add up to a tidy sum of money you can get back. You can do that just by using the card for standard purchases, like gas and restaurants; things you would normally spend cash or savings on anyway, and without the bonus. If you manage to accumulate the cash returned over a few years of spending, that seemingly small amount of cash rewards suddenly turns into a significant sum, so remember, it all adds up. If you are savvy with the way you use your card and how you pay it off each month, it could turn out to be a strategy that helps maximize the benefits you might be able to claim. A cap on the number of points you can earn each month or year. Only earning reward points with affiliated point partners. The points may have an expiration date. These are all details that you should look out for before committing to a card. It might also turn out to be a win-win situation when you pay off your balance more frequently, as it can help improve your credit score. This, in turn, might open the possibility of a credit limit increase and with it, the opportunity to build up even more rewards. Getting cash back on your credit card is a great incentive, but it is not the only way to get your credit card to reward you for your spending, depending on the card offered, there may be other rewards schemes available, as well. It is often the case when you sign up for a new credit card that you can also get a decent amount of bonus points to set you on your way. Flights and hotels can soon be within your reach as you start to accumulate rewards points each time you use the card. When redeemed, these rewards points are in effect equivalent to using cash to book flights, hotels and even dining out. The level of consumer protection that you enjoy with your credit card is a bonus. It makes sense to use your card for purchases online or when you are out and about, especially when you consider you will often be covered for any loss incurred through fraud or identity theft. 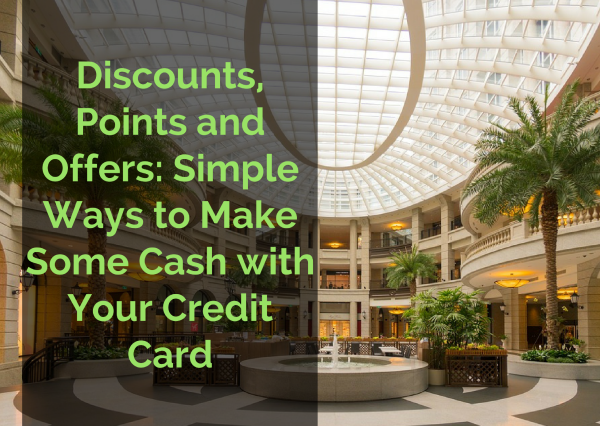 You will often find that your card provider may have partnered with some selected retailers, to offer some added bonus points or cash back rewards. Check back regularly on your provider’s website for any new offers and promotions. Look out for these deals and incentives, as you already know you can shop with confidence, safe in the knowledge that your purchases will be protected if there is a problem with the items, or if they get lost during shipping. If you use your credit card wisely and in all the right places, you can use it to maximize your benefits and rewards. With a little bit of know-how, you will find that little piece of plastic can deliver some great deals, and even putting cash back in your bank account.